No school on Monday because of Memorial day. The fridge was pretty empty on Tuesday, so I had to raid the freezer and the pantry to feed the kids. Nothing wrong with that, though, right? That’s why I fill those babies up! 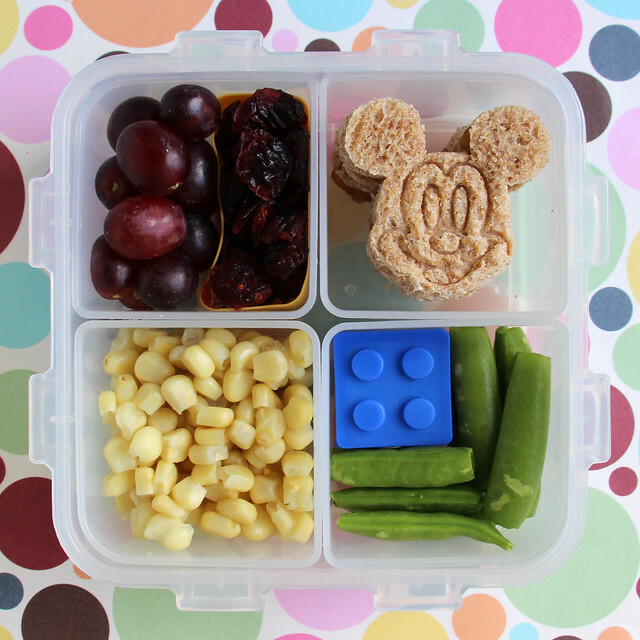 Augie had grapes, dried cranberries, two little Mickey sandwiches filled with jam, snap peas, hummus (in the Lego box) and some frozen corn. This was packed in a Lock & Lock bento box. It was Wyatt’s turn to take our new Yumbox out for a spin. 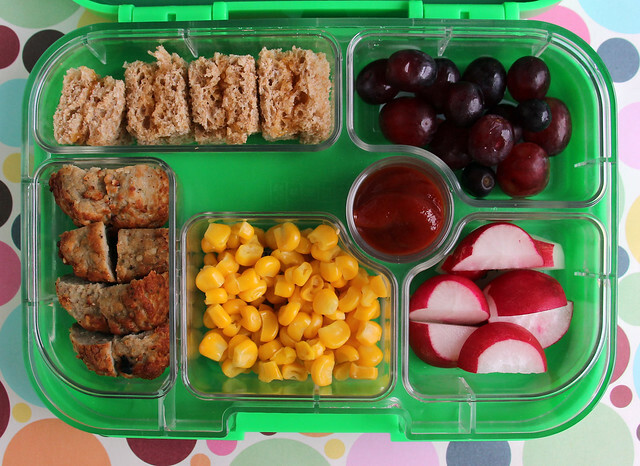 I filled it with tiny jam sandwiches (you can barely see the jam, but I promise it’s in there), the last of the grapes, turkey meatballs from the freezer, corn and radishes. He recently decided he officially loves radishes and now eats them with gusto. Go figure! Augie’s turn for the Yumbox again! The kids are super into this box so they are taking turns bringing it to school. I’m not sure if they like it so much because they really think it’s cool or because it’s new, but there is some serious love going on for it at the moment. 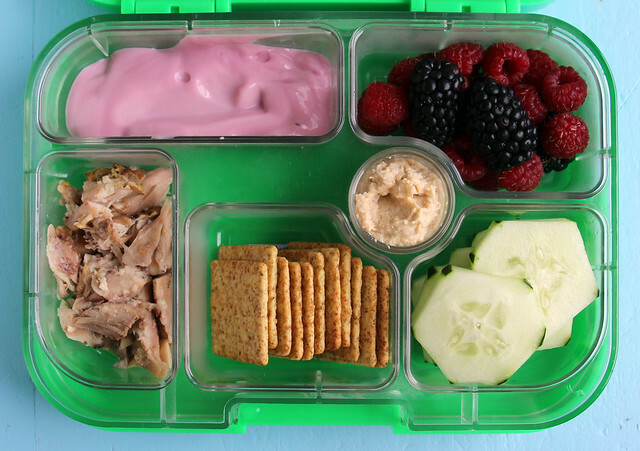 This is what I put in it: berry yogurt, raspberries, blackberries, cucumber slices, hummus, wheat thins, and leftover citrus chicken from dinner the night before. 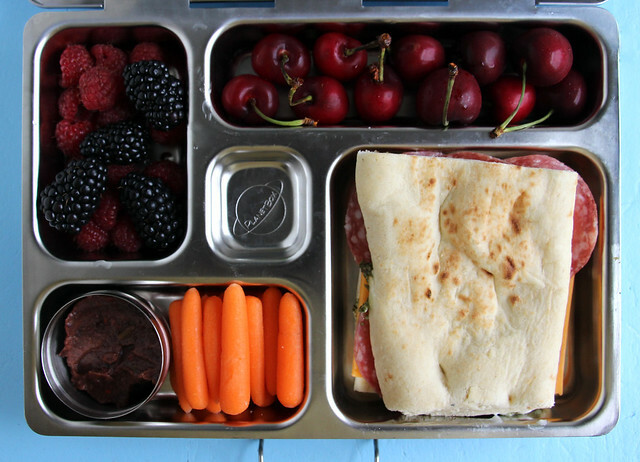 Wyatt’s lunch was packed in the PlanetBox : raspberries, blackberries, cherries, carrots, black bean dip and a salami, cheddar, pesto and mayo sandwich on garlic naan flatbread. As I mentioned last week, he made this sandwich up and I have to admit that it’s pretty rockin’. I had one for lunch myself on Wednesday, inspired by this photo. Augie was home sick Thursday, so no lunch for him. 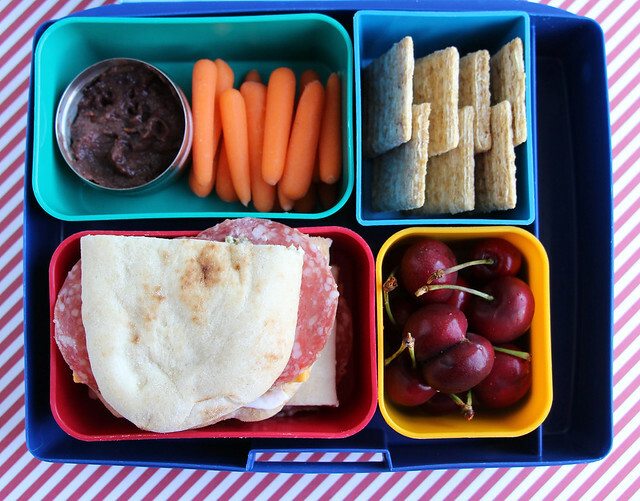 Wyatt had a near repeat of his lunch from Wednesday but this time it was packed in a Laptop Lunches box: carrots and bean dip, Triscuits, cherries and his the same salami, cheese and pesto sandwich. When he came home I noticed that he’d barely eaten any of his sandwich and when I told him I was surprised he very carefully explained to me that it wasn’t the same as the ones he makes because the pesto and mayonnaise were mixed together on my version, whereas when he makes them he puts only one of the spreads on each piece of bread. Gotcha. It’s a pleasure serving you, your royal highness. 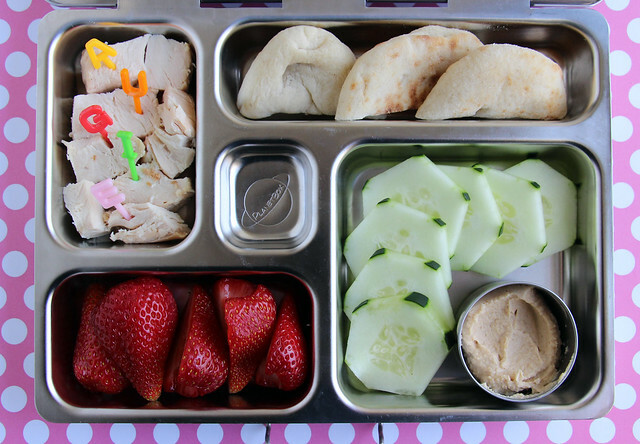 Augie went back to school this morning and I packed his luncheon in the PlanetBox : leftover roasted chicken with alphabet picks spelling out his name, semi-circles of garlic naan, cucumber slices, hummus and strawberries. 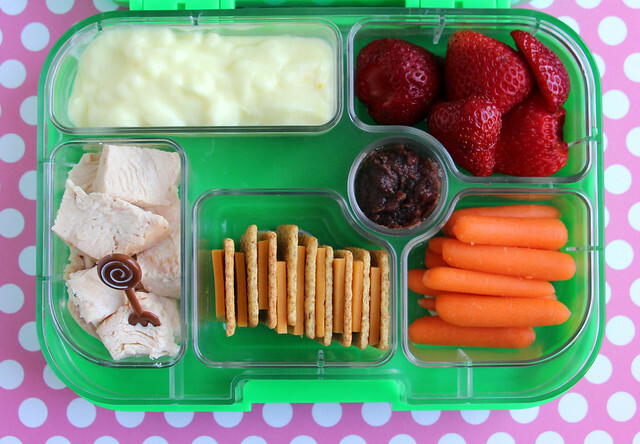 Wyatt’s lunch was in the Yumbox: lemon yogurt, strawberries, carrots, black bean dip, cheese and wheat thins and leftover chicken. I gave him a little fork pick to eat the chicken too, but then as I was packing it in his lunch bag, I remembered the yogurt so I threw in a set of Lego flatware too. Next week is the last week of school and I CAN’T WAIT! Woo hoo!